Oct. 11, 2018 – Forward looking thinking and the determination to be a leader in forest industry technology, has positioned Idaho Forest Group at the forefront of the North American sawmill industry. Over the past few years, the company has made significant investments in its Lewiston dimension lumber sawmill to boost quality and production numbers. Idaho Forest Group’s Jesse Short is among the speakers confirmed at OptiSaw – the one-day mill optimization and automation forum. 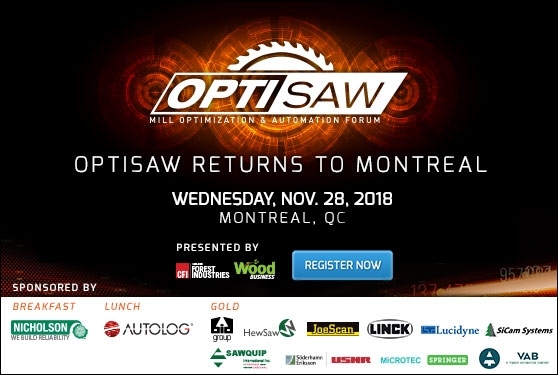 Hosted by CFI magazine, OptiSaw is returning to Eastern Canada to hold an information-packed event in Montreal on Nov. 28. Lewiston sawmill has installed a HewSaw SL250 3.4 multi-unit sawline, a merchandizing and log sorting system from Springer and CT X-ray scanning technology from Microtec, complete with X-ray fingerprint technology that identifies the log early in the process and executes the optimal CT solution at the sawline. Short will join Bill Tice from HewSaw and Norvin Laudon from Springer-Microtec for a candid talk about this line, how the project transpired, and how the technology helps Idaho Forest Group reach record breaking production numbers while producing a sought after, high quality product.